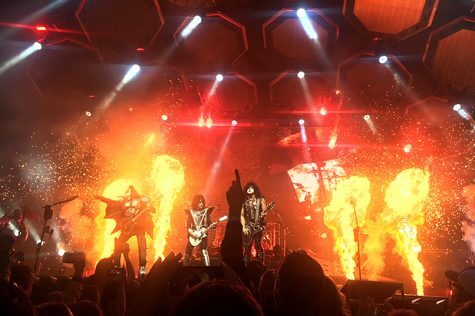 Kiss brings the heat at PPG Paints Arena for the “End of the Road” farewell tour. Searing pyro and shrill screams have become essential components of Kiss concerts over the band’s near 50-year career. That familiar territory bolstered by fans, along with a few new tricks, was on full display for their final show in Pittsburgh at PPG Paints Arena last Saturday. Kiss practically invented the modern day version of an arena rock show when they burst onto the New York club scene in the early ‘70s. They looked unlike any other band, first of all, with each member donning war paint to march their alter ego of either the Starchild, the Demon, the Spaceman or the Catman. They breathed fire and dodged pyro on stage in platform shoes and “battle armor,” to boot. And they still do all of that. Kiss’ ‘End of the Road’ farewell tour comes in the midst of similar final outings from artists like Ozzy Osbourne and Elton John. While those artists have more or less adapted their shows to fit their age, Kiss has pushed themselves even further with their if-it-aim’s-broke-don’t-fix-it glitz and glam at a new level. The band entered PPG Paints Arena from above, descending down to the stage on octagon-shaped platforms for “Detroit Rock City.” Sparks lit up behind them as lead singer Paul Stanley shimmied at the microphone, wagging his finger while bassist Gene Simmons wagged his tongue. Typical stage moves and a typical entrance for Kiss, but that didn’t make it any less exhilarating. Their current stage setup is one of the biggest feats for Kiss in recent memory. Previous concerts at KeyBank Pavilion limited the scope of the stage for people out in the lawn, but in the arena, the stage appeared like a spaceship with those same octagon platforms raised above the stage looking like interstellar honeycombs as big screens videotaped the band and fans. Stanley parted the crowd like the red sea, eliciting screams from both sides of the arena in competition. He commanded the Kiss Army (Kiss’s aptly named fan base) to “Say Yeah” with a song from 2009’s “Sonic Boom.” Bass-heavy “Modern Day Delilah” would have been a more appropriate cut from the album given the song’s meek response. The Demon brought things back around with “I Love It Loud” and the charging “War Machine,” featuring Simmons’ iconic fire breathing routine. A young fan in a Demon costume was lifted by his parents just a row in front of me. Simmons pointed to him in acknowledgement. A Kiss concert is an affair that spans generations. Kids, parents and even grandparents, arrive in Kiss makeup or t-shirts, symbolizing the passing of the fiery torch. Simmons “better watch out,” though. That kid was a celebrity in his own right, with excited fans coming up to take their picture with the little Demon pre-show. Kiss honored the classics when they incorporated The Who’s “Won’t Get Fooled Again” into the bridge of “Lick It Up.” Stanley and lead guitarist Tommy Thayer huddled together for the rhythmic breakdown before Stanley let out the song’s epic scream. 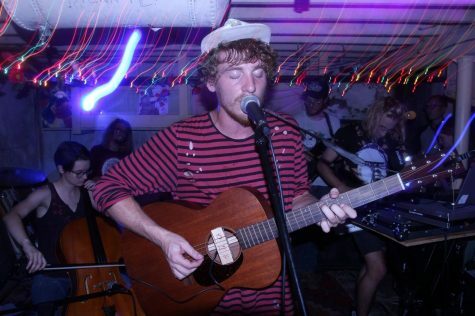 Tracks from the band’s back catalogue got the most praise from longtime fans. 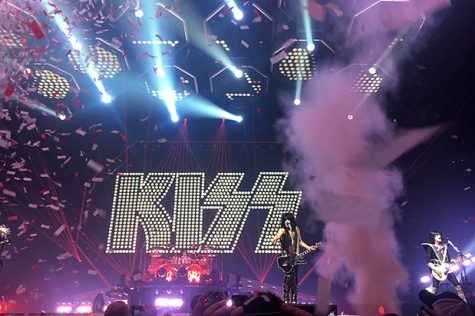 Kiss perform “Rock and Roll All Nite” in a finale complete with confetti and fireworks. For an arena rock show, Kiss made the evening feel pretty intimate. Stanley ziplined over to a little platform at the back of the arena for “Love Gun” and “I Was Made for Lovin’ You.” Simmons and Thayer got on cranes that extended out into the arena for the confetti crazed, firework finale of “Rock and Roll All Nite,” making Fourth of July celebrations look dismal. I also have it on good authority from people in the nosebleeds that they could feel the flames (even if they were delayed by a few seconds). I, for one, had whiplash, the heat smearing my eyeliner. It’s a miracle Kiss don’t look like a mess come the end of the show.